Hello everyone and Happy Monday! Today we're going to do something a little different. I was nominated by the lovely Miriam over at Simply x Classic to participate in this fun little tour through blogland. It's so nice to meet and get to know other bloggers, so today I will be introducing you to three blogging ladies I think you'll love just as much as I do, as well as answering some of Miriam's questions so you can get to know me a little better. My blog kind of started as an experiment. I knew I wanted to have one, but had no idea what it would be about. For the first couple of years it was ramblings and recipes with an occasional outfit post. I had been toying with the idea of transitioning to a full on personal style blog for a while and after much deliberation, decided to go for it back in June, while also maintaining a little bit of that "lifestyle" aspect through weekly cocktail posts and recipes. I've been working to cultivate a space where I can share what I'm wearing, what I'd like to be wearing, and some of my favorite recipes, which oddly enough has made me realize just how much I love whiskey. Well, I haven't seen many personal style blogs with a weekly cocktail so I guess I've got that going for me. If you have, please point me in their direction, I'm always looking to try new things. My personal style is sort of simple and understated compared to a lot of other bloggers, which in turn could make me appear boring, but I feel that there is value in being a little different, uncomplicated. I like to mix high and low end, focusing on classic and basic pieces that most likely are already part of your wardrobe so a lot of my looks are easy to recreate. My goal is to share how to make those pieces stand the test of time, how to wear and remix them so it's always a little different while still being current and wearable. As much as I hate to admit it, these days it usually begins with me running late because I can't decide what to wear. I try to come up with different combinations but they don't always look how I'd hoped, which can become time consuming. The weather is also a factor. We shoot if we have time, often as I'm running out the door. I write my copy at the end of the day, at that point where I think I'm really funny, and make jokes and references that I hope don't get taken seriously. JD approves them for me. Then I click post and hope at least one person catches them. Usually it's one of these three ladies. 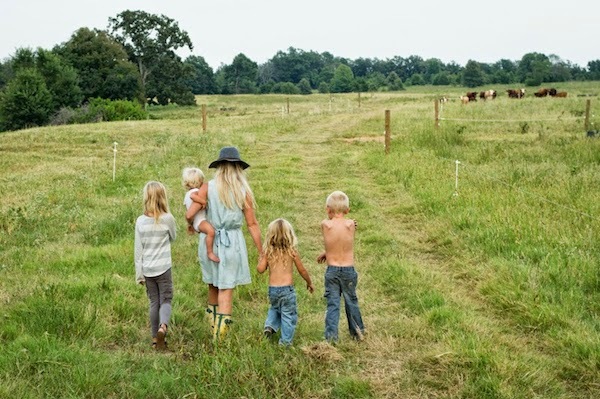 I am a mother to four beautiful little wild ones, and my hubby (who is oh so dreamy) and I live and work on our farm here in Arkansas. We are homeschooling our wee bits, while attempting to learn all the ins and outs and complicated facets that come along with farming, and we are baby-stepping our way into homesteading. It's an adventure to say the least! This is my journal of sorts. Documentation of us tackling something we've never done and honestly don't know much about. It's a place to record, to remember the little moments and the big, to celebrate milestones, the mundane and the chaotic. More than all of that though, it's a place for me. To remind myself of all the happy that comes with this beautiful journey of being in love, of motherhood, and our adventure together. Hi, I'm Kristina and I blog over at Kristina does the Internets. Kristina does the Internets is a life and style blog, where I talk about clothes, food, diy projects, and my adventures through Chicago. Besides blogging, I love shopping (of course), exploring my neighborhood, wedding planning (I'm tying the knot next summer! ), and obsessively quoting Parks and Recreation. 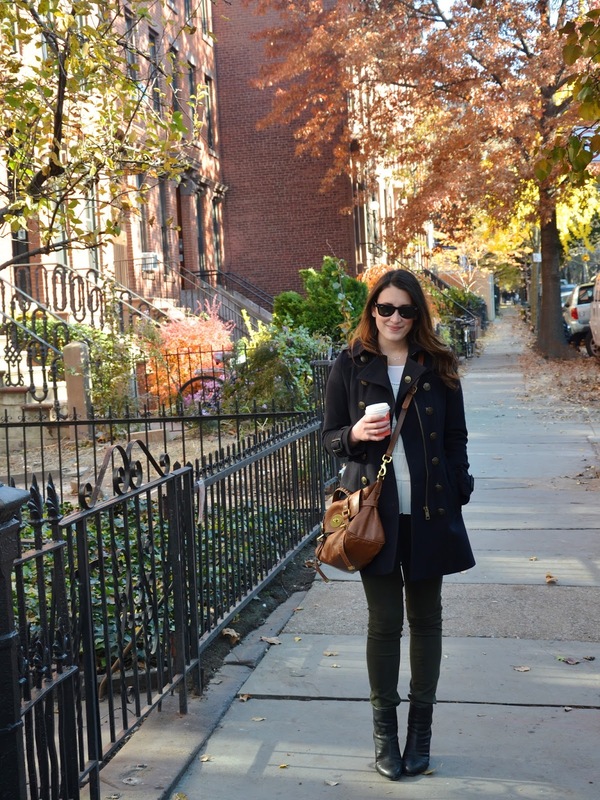 Mary-Katherine is the California turned Kansas City girl behind the life + style blog Gold-Hatted Lover. There she shares everything from her outfits, current cravings, weekly recaps, travels, playlists and more. She loves that having a blog gives her a perfectly good excuse to get dolled up every day and treasures that it also acts as a way to document her life adventures. And there you have it. Be sure to check out these lovely bloggers and thank you so much for reading! I love this post! It's so fun to get to know the lady behind the blog! I always love seeing your chic style and the cocktail recipes are perfect! I giggled when you said it made you realize how much you love whiskey. I love your understated sense of style and your cocktail recipes. That's what keeps me coming back! :) Happy to read more about you girl! Loved getting to read a little about you! I always love all your fun cocktails! Such a great post! I love getting know my fellow bloggers and being introduced to new ones! I'm definitely going to check these out! I love your weekly cocktail recipes! They're always something fresh, seasonal and unique. And as a person who sticks to the classics, I appreciate your easy and effortless style. I love mixing and matching timeless pieces that are already in my closet so your looks are a perfect source of inspiration! I love this post!! Love hearing about bloggers I haven't discovered yet. And I love your classic style and unique post each week with a fabulous cocktail recipe! Such a great post and loved getting to know a little bit more about you and why you blog!! I think it's so interesting how you transitioned your blog - I love your style!! Love learning about you and so happy to be introduced to another Chicago blogger! always love getting to know a little more about you and glad i can be one of the readers who appreciates your one-liners, they get me every time! thanks again for featuring me, can't wait to check out those other gals! I don't know why but I just became upset. (what's wrong with me today). I don't like the comment, "compared to a lot of other bloggers, which in turn could make me appear boring". I don't like the fact that it seems you're comparing yourself to others. We as females do that enough when just walking down the street. I think your blog is great! I like the everyday girl simplicity of it. If there is a girl out there that wants a fashion/style role model, you make it very easy. Your look is very attainable & realistic. I visit your blog daily. Granted your style is a little more casual than mine, but we're in the same pool. We have some of the same basics and who doesn't. From what I can see, the main thing that seperates us is that I love lots of color. Like many other blogs, you provide classic casual fashion that has a personal spin to it. There are other blogs out there (that I enjoy visiting as well) that are a BUSINESS. Meaning, clothing is gifted and/or loaned to them regularly. Many of the pieces are high-end and fashion forward. Some of the bloggers have a team (hair, make-up, photographer, PR, etc.). I know this for a fact as I ran in to one of my favorite bloggers one day back in 2013. It was a sunny Friday and I was off from work. My boyfriend (who took off from work) & I came upon a group of high-pitched girls walking down PAS. We were walking across 25th St. and were approaching PAS heading to Madison Square. I could hear them before I actually saw them. We had to stop to let them pass. In the middle of this group of what seemed to be 15 girls (really I think it was only 6) was a blonde woman dressed way more stylish than the other girls. I said to Jude, I know that girl. He said, from where. I responded, I don't know. About 40min later as we're enjoying our picnic in the park I blurted out, that's blah blah blah. That's when I realized, she's got a team. Keep doing what you're doing and people will continue to follow you. Sorry for the rant. thanks for sharing! and I love that photo of you - fall perfection! What a great idea! Love this post, and love learning more about you! Love getting to know a little bit more about you, and I for one, have always loved your blog. I like that you feature clothing that is actually accessible and wearable, combined with your one-liners and cocktails, and it's the perfect mix. It's why I have enjoyed it from the beginning and have become a faithful reader. Thanks for featuring my little blog, that was so kind! I love: "where I think I'm really funny, and make jokes and references that I hope don't get taken seriously." From your comments on my blog and posts I can tell I would love your sense of humor, censored or not!